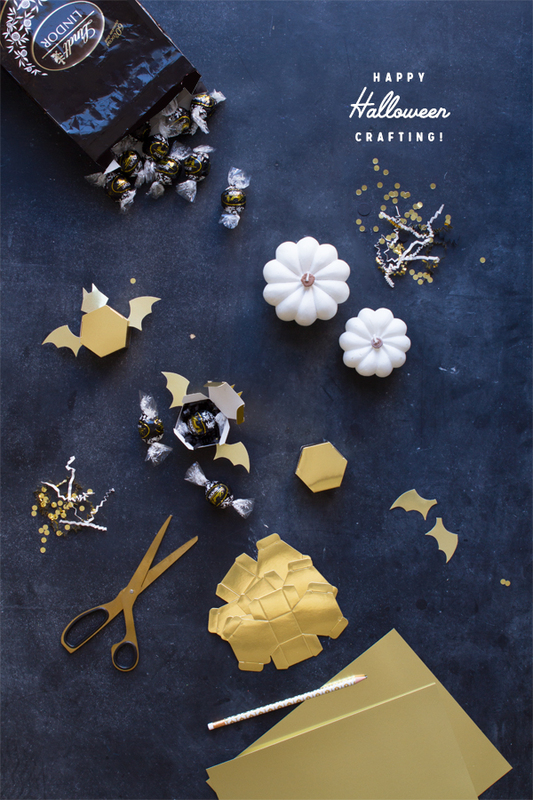 We’re partnering up with Lindt today to help you create some awesome Halloween favors! 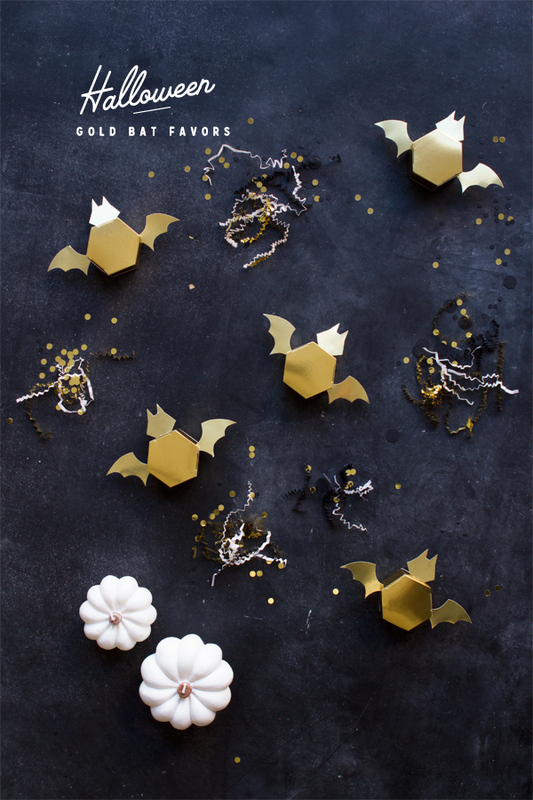 If you’re throwing something a little fancier than your average Halloween do this October, these gold bat hexagon favor boxes would make the perfect fit. Cute, modern and elegant they make an ideal casing for a decadent chocolate treat for your guests. Plus our favorite chocolates, Lindt LINDOR Truffles, fit perfectly inside! 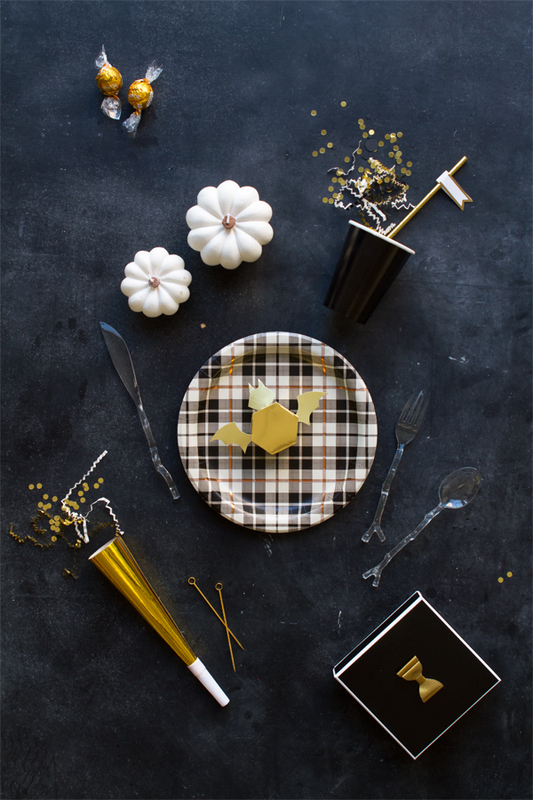 Tools and Materials: Bat template, Printer, Scissors, Pencil, Gold cardstock, Lindt LINDOR Truffles (Extra Dark & Caramel), Hexagon Favor Boxes, X-acto knife, Black paper shred (optional). Step 1: Download and print out the bat template and cut out both the wing and head using scissors. Step 2: Lay gold cardstock face down, place the wing template down and, using a pencil, trace around. 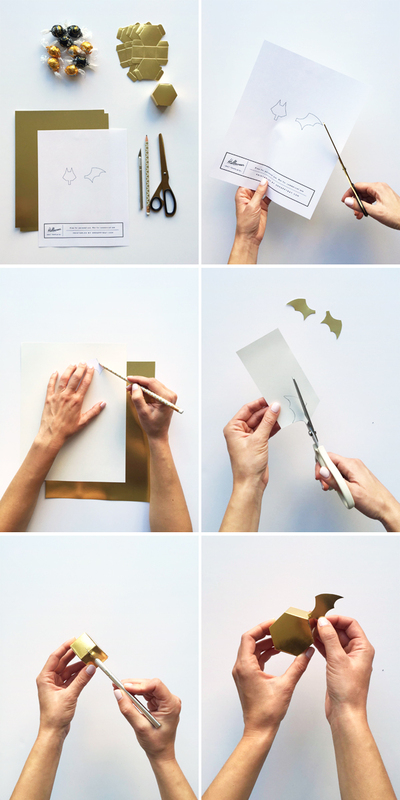 Flip the wing template over onto another part of your cardstock and trace. Also trace around the head template. Step 3: Using scissors, cut out your gold wings and head. Step 4: Using your x-acto knife, make slits on one corner of the hexagon box. Do the same to the opposite side. Also make a slit in the top. Slip the gold wings and head into their corresponding slits. Step 5: Open your hexagon box and place one LINDOR truffle inside. You can also create a nest of black paper shred underneath your chocolate if you so desire. Those are cute and elegant at the same time, I love them! Sadly Halloween trick or treat isn’t such a huge thing here in Germany, but I’ll sure find some other occasions for crafting these! These are just too cute!! Also, Lindt chocolate is my weakness and I will use any excuse to buy it (like making these cute bats)! These bats are so adorable! I’m totally obsessed! ok…..this is seriously the most adorable!!! I love giving tiny favors away at work (if I don’t host a party) so these sort of ideas are simply PERFECTION!! Thank you tons!!!! How fun! Love these cute, little bats. Add chocolate – even better! This is getting me in the mood for a crafty Halloween party. These are so cute! Absolutely lovely! oh wow these are so cute.. love them.